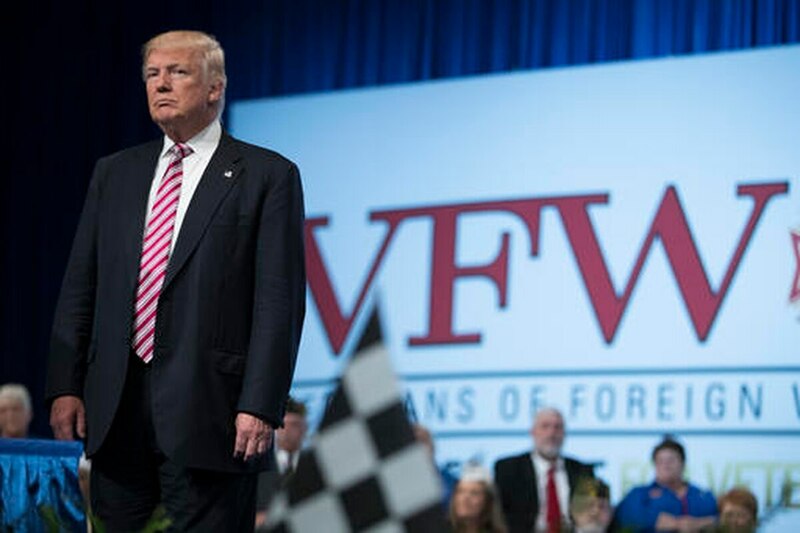 Republican presidential nominee Donald Trump promised a massive overhaul of the Department of Veterans Affairs during his appearance at the Veterans of Foreign Wars convention Tuesday but also pledged that the government-backed veterans health care system will not be dismantled. "Our debt to [veterans] is eternal," Trump told a largely supportive crowd at the event in Charlotte, North Carolina event. "Yet our politicians have totally failed you. Our most basic commitment, to provide health and medical care to veterans, has been violated completely. "The VA scandals that have occurred are widespread and totally inexcusable. Many have died waiting for care that never came, a permanent stain on our government." Trump's remarks, largely a repeat of the 10-point veterans reform plan he laid out earlier this month, came less than 24 hours after Democratic presidential nominee Hillary Clinton spoke at the same event and less than a hour after VA Secretary Bob McDonald addressed the crowd. Both Clinton and McDonald offered a distinctly different view of the department today, calling it a troubled system on the path to reform. Trump called it a disaster. "When I get in the White House, you'll see a change in VA and the whole of the government system, which is a mess," he said. "A change in attitude and a change in results will absolutely take place so fast." That will include firing problematic VA employees workers at VA, installing a hotline in the White House to field veterans’ complaints, rooting out waste and abuse in the VA budget and massively expanding health care options outside VA for all patients. Critics have labeled that last proposal a privatization of the department, but Trump pushed back on that idea. "The veterans health system will remain a public system, because it is a public trust," he said. "But veterans will have the right to see a private doctor or clinic of their choice … There will be no more five-day waits in line." Unlike Clinton, who spent most of her Monday speech attacking Trump, the GOP nominee largely avoided targeted attacks against his rival, save for a few references to "crooked Hillary." Instead, he attacked the "rigged system" and media for downplaying the populist message of his campaign. "We can't fix a rigged system by electing the people who rigged it in the first place," he said. "Let's reject the doubters and cynics, and choose again to believe in ourselves." Convention attendees offered a much warmer reception for Trump than for Clinton, chanting "U-S-A" and "lock her up" at several points during the Republican nominee's speech. The Democratic convention continues throughout this week in Philadelphia, with Clinton expected to address the country on Thursday, the event's final night.